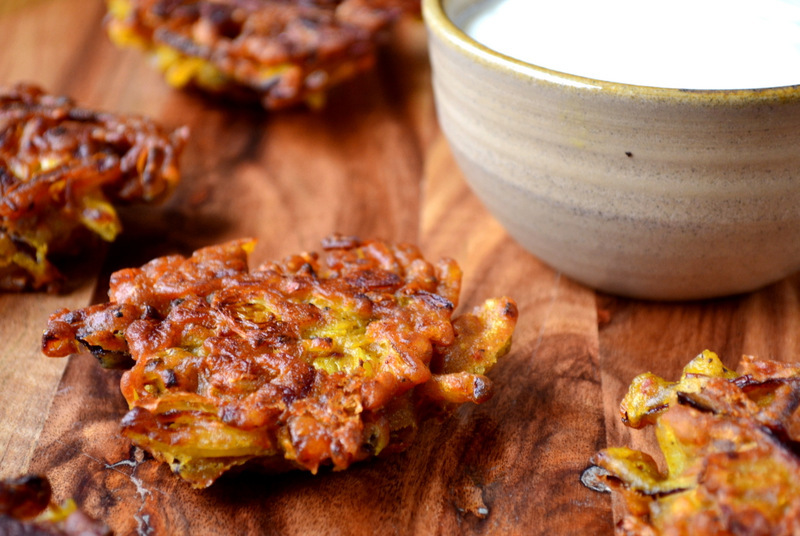 Onion bhajis are the perfect accompaniment for many an Indian dish – meat-based curries benefit particularly from their presence as they provide a tasty, vegetarian contrast. Most people insist on purchasing sub-par bhajis from their local supermarket – I know not why – despite the fact they are exceedingly simple and quick to make – as the recipe below attests. Let’s hope that the almost seductive, golden-brown hue of these unassuming, spicy Indian snacks weans the general public off their mass-produced supply and onto something a little more choice. Excuses shall be ignored. 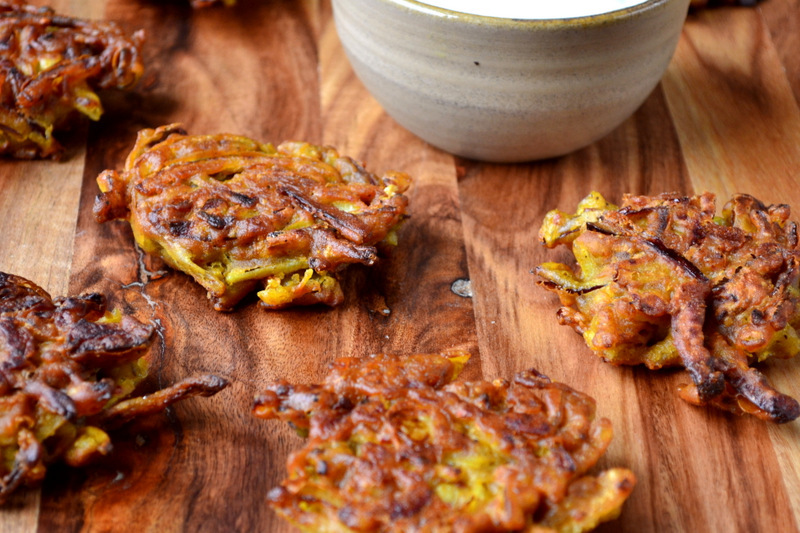 So perfectly brisk are these bhajis that they have developed the curious habit of leaping from my (gorgeous) skillet with peculiar regularity – perhaps once or twice per week. Indeed, not only are they ideal for simultaneous consumption with all manner of Indian feast, they have a tendency to work jolly well as a meal all of their own. Every facet of this frugal onion bhaji recipe is bulging with flavour – from the gram flour to the spices – so much so that one could even spend lunch alone with a few and emerge satisfied. However, serve them with yoghurt/raita and pita and you’ll soon be leaping from your bath ejaculating (no sniggering) eurekas here, there and, perhaps, everywhere. Indian food is one of those cuisines that has a million and one side-dishes that could accompany each curry. Similar to these bhajis, my recipe for Spinach Pakoras make for a flavoursome and crispy accompaniment. 1. Slice the onions and put them in a large mixing bowl, separate each individual slice. Add all of the spices, garlic, ginger, gram flour and salt and mix it around a little. Add 1 tbsp of sunflower oil and 60ml of water. Mix it all together and add a little more water if the mixture isn’t loose enough – the batter should adequately coat the onion. 2. Heat 4-5 tbsp of sunflower oil in a thick based pan over a medium heat. Once at temperature, take a little of the mixture and place it into the oil. Fry until golden brown on each side, allow enough time to cook through. Soak up any excess oil with kitchen roll. 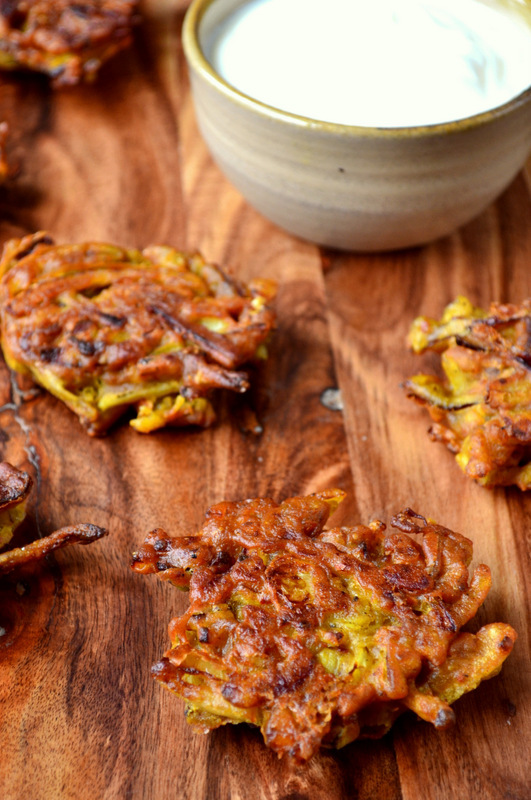 Cost: Everything about onion bhajis is frugal; onions and gram flour are exceedingly cheap. Indeed, the entire batch, enough for 3-4 people, should set one back no more than 80p! Those look good. I’ve had mixed bhaji curries and omelettes but never these onion snacks. Good idea. This recipe is definitely a must-try! Thanks, Daisy! Hehe – little critters! These look so much crispier and full of flavour than the store bought ones. Will definitely try next time I make a curry. Oh they are, store bought ones are often dry too. These look better than most of the versions I’ve had in UK Indian restaurants. 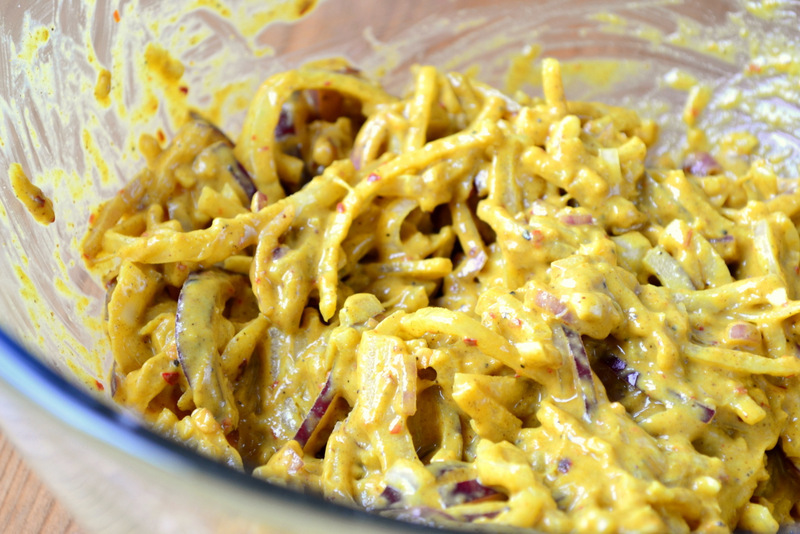 Another one of yours on my recipes-to-try list…. Thanks! You must try them! I have never heard of these – but they look quite tasty! I want them to hop out of my skillet 1-2 times per week too! Haha – thanks! I have tried lots of ethnic food, but find myself coming frequently back to Indian! I shall be doing more varieties, never you fear! Your life sounds heavenly. I want the sun to go down after 5pm please! With a salad and some homemade mango chutney these make a meal in themselves. Absolutely – I hope you’ve seen my recipe for mango chutney! Oh no, not necessarily! Please do! These look really nice and crispy! Don’t like the ones that are a bit doughy in the middle but these look perfect! Yum! Must make some of these. I’m certain I could get into the habit of making these at least once per week.. such wonderful treats!! Gorgeous! I love that you use two kinds of onion. Ooh those look gorgeously crispy and greasy (in a good way) – I want to reach into the screen and pull one out! They were just that, Loaf! I’m afraid we haven’t developed that technology yet! This is our go-to lunch when pretty well all we have in the house is, well, onions… But we’ve been casting around for the perfect recipe. We tried this one today – and it looks like this is it! Delicious w some home-made mango chutney and (fusion cuisine!) don-don noodles. Thanks! I got hooked on onion bhajis when I was studying in the UK, but only recently did I start to see them on the occasional menu in America. And since few Americans have any idea what they are, and therefore don’t order them, they’re usually not great. But making my own… good idea! That’s a shame – you must! Wow. Another frugal food education. I love the look of these Nick, I could see how one could quickly get addicted and want to make them all the time! 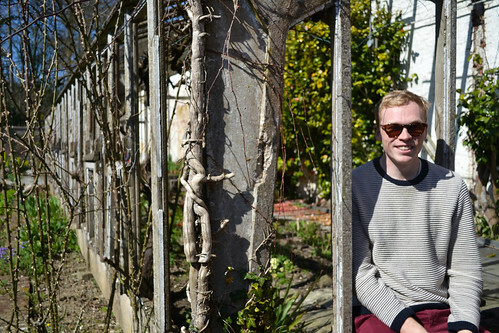 They are really nice, Somer! You could make these, right?! You should. I will have to try them, they sound really lovely. Oh they are, they are! If they’re able to leap out of your skillet, they ought to be able enough to leap out of mine. 🙂 Crispy, tasty looking way to prepare onions — thanks! Those look great and easy to make. Ohmygod… I have plans to try to make this paleo-friendly! They look amazing! That’s a great idea… tempting! Thank you – I hope you give them a shot. I make them regularly. Hi, was wondering of you know how long they would keep for? In a container in the fridge. Sorry for the slow response – in the fridge they’d last 2-3 days. However, I’d warm them back up before eating, preferably with a sprinkling of lime juice or even water. Refrigerating tends to dry them out a bit.